Our Company Iqra Creation Established in the year 1992 at Agra (Uttar Pradesh, India), we, “Iqra Creation”, are the leading manufacturer, exporter and supplier of an outstanding collection of Zari handicraft boxes. Compact Mirror, Handicraft Fashion Bags and Christmas Ornaments are the offered range of products is precisely designed, crafted and polished by our skilled artisans using advanced tools and methods as per the set industry standards. The products that we use are authentic and procured from the certified vendors of the market. All these products goes well with the existing market trends and highly acknowledged for their lustrous appearance, eye-catching appearance, excellent finish, smooth polish, intricate design, attractive look, trendy appearance and fine finish. In addition to this, clients avail these products from us in various specifications in terms of sizes, shapes, designs, patterns and colors at affordable prices. To fulfill the varied requirements of several clients, we have hired a dexterous team members, who are highly experienced in their respective field of domain. The entire workforce includes designers, craftsmen, quality analysts, packaging experts, sales personnel and others, who all are working with the clients in order to meet their exact specifications. Our company is well recognized manufacturer, exporter and importer of premium quality assortment of Zari Clutch Purse in Agra, Uttar Pradesh, India. 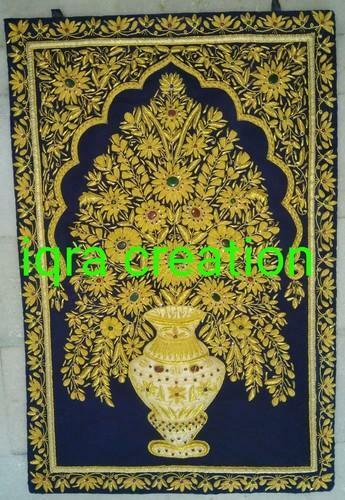 We are manufacturing, exporting and supplying a Attractive Beaded zari embroidery handicraft product in Agra, Uttar Pradesh, India. Those are made by high grade of material.